2015 Friends of Scholastic Journalism – Missouri JEA. 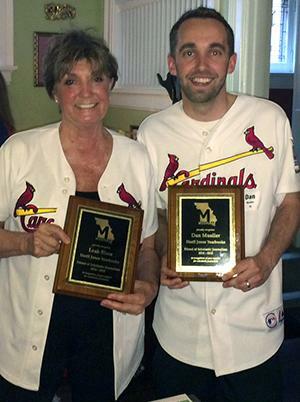 Herff Jones Yearbook representatives Leah Blase and Dan Mueller have been named the 2014-2015 Missouri Journalism Education Association’s Friends of Scholastic Journalism winners. Blase has been a Herff Jones representative in St. Louis for over 20 years. Her schools consistently win top awards and credit her insightful input and attention to design detail, as well as her boundless energy, for much of their success. Blase serves as co-director of St. Louis camps and training workshops and is a member of the Herff Jones Hall of Fame. She has also earned Certified Journalism Educator status from the Journalism Education Association. Mueller joined the Herff Jones team in 2004. He is the former production editor of the Hazelwood West HS Focus and the former editor-in-chief of the Saint Louis University Archive. As a student, he won a JEA National Excellence Award, but it is his work with yearbook staffs for which he is most proud. He assists with production, computer support, design presentations and photo shows. Affectionately called “the closer” by many advisers, he’s there when deadlines are the toughest.